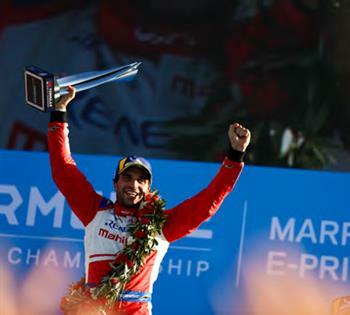 12 JANUARY 2019, MARRAKESH, MOROCCO – Mahindra Racing reigned in Marrakesh once again as Jérôme D'Ambrosio took a stunning win today, after starting from tenth, to mark the second year in a row the Indian team has taken the spoils at the Moroccan track. Today's event, the second round of the 2018/19 ABB FIA Formula E Championship, saw Jérôme, who scored a podium last time out in Saudi Arabia, and Pascal Wehrlein piloting the two M5Electros. Qualifying groups this year are determined in championship order so, after his third place podium finish in Saudi Arabia last month, Jérôme headed out in Group 1, while Pascal was in Group 4. Jérôme set a fastest lap of 1:18.440 to secure a fifth row starting position from tenth. Pascal narrowly missed out on Super Pole on his Formula E qualifying debut, setting a lap time of 1:18.126 to line up seventh on the grid from the fourth row. On the first lap, Jérôme deftly avoided a first corner mess to move up from his tenth place starting position to fifth. On lap 14 he passed DS Virgin's Sam Bird for fourth and two laps later passed Bird's teammate Robin Frijns to move into a podium finishing third place. The two BMW cars of Antonio Felix da Costa and Alexander Sims collided, allowing Jérôme to race through into the lead. A safety car then bunched up the pack, with green flag racing resuming with just a lap to go. With a field of drivers with everything to play for, Jérôme expertly kept his cool at the front and took the chequered flag as the victor. "This is an amazing way to finish the second race. I'm so happy for the team; everyone has worked so hard and I'm proud to be a part of Mahindra Racing. I'm really happy and it's great to be leading the championship early on. It's a good motivational tool for everyone and now we have to keep on working hard. I'm really thankful for everyone to have given me a chance – today feels amazing." "It wasn't the race debut that I wanted, but I'm very happy for the team to score this amazing win. This race and the last one in Saudi shows the team has the capability of great results this season and so that is a good positive to take away. I was happy with my qualifying and felt I could have done a better lap so the pace was there. Unfortunately, at the start of the race one particular driver was a bit over motivated on the first corner. It's very frustrating but I will now focus on the next race in Santiago and working hard to prepare for that." "I am absolutely thrilled with the win today. Marrakesh is definitely a special place for us and to win here two years in a row is something that I'm very proud of. The whole team did a fantastic day today and Jérôme drove a mature, brilliant race to give us this win. We had a great strategy and used Attack Mode in some clever places. Jérôme put himself in a very good position to take the advantage when it mattered. I'm very sorry for Pascal. He qualified really well and I'm sure we would have had both cars right up there had he not been hit on the first lap. While we enjoy today, we now turn our attention to Santiago and the objective of having both cars finish well." The 2018/19 ABB FIA Formula E Championship resumes in two weeks' time, with the Santiago E-Prix in Chile taking place on 26 January 2019.
a race as Formula E continues to push the limits of technology and electrification. some of the most iconic cities - including Hong Kong, Marrakesh, Paris, Berlin, New York and Montreal. The championship represents a vision for the future of the motor industry, serving as a platform to showcase the latest innovations in electric vehicle technology and alternative energy solutions. Future seasons will see the regulations open up further allowing manufacturers to focus on the development of motor and battery components, which in turn will filter down to everyday contemporary electric road vehicles. The Mahindra Group is a USD 20.7 billion federation of companies that enables people to rise through innovative mobility solutions, driving rural prosperity, enhancing urban living, nurturing new businesses and fostering communities. It has a leadership position in utility vehicles, information technology, financial services and vacation ownership in India and is the world's largest tractor company, by volume. It also enjoys a strong presence in agribusiness, components, commercial vehicles, speedboats, consulting services, energy, industrial equipment, logistics, real estate, steel, aerospace, defence and two wheelers. Headquartered in India, Mahindra employs over 240,000 people across 100 countries. the 2018 Dow Jones Sustainability Indices (DJSI). Jérôme D'Ambrosio wins the 2019 Marrakesh E-Prix.